In the latest issue of the journal, Tanya Stivers and Jack Sidnell have an exciting and suggestive account of how children collaborate in joint activities, and specifically on how they propose things to each other. In this short guest blog, Tanya Stivers gives a back-stage account of their project. In this article, Jack and I looked at school age children playing together. We found that the data are replete with joint activities and ways of starting and modifying joint activities. One way kids secure another’s participation is to propose an activity. We found that kids frequently use both “Let’s X” and “How about X” to do this and examined the basis for selection between these two alternatives. The “Let’s” cases seem to involve starting something new but as we moved the analysis forward we realized that it’s not exclusively “new” but rather the disjunctive nature of the activity being proposed that is being highlighted by the use of this form. In contrast with “How about”, the disjunctive character of the new activity is minimized and this is used more often in activity modifications and negotiations. Deviant cases allowed us to observe that even children can use these forms reflexively and thus communicatively. We have worked on these data involving school age children engaged in informal interaction for some time. Few people are working on this age group (4-8 years of age), so it’s exciting to learn more about issues of development in social interaction. should children be treated as fully competent interactants? – a general premise of conversation analysis. if children spontaneously interact while engaged with toys, how does that compare to adults who are generally spontaneously interacting while engaged in eating, cooking or other tasks? a third related issue is when we find that children rely on Let’s vs How about in different contexts, to what extent can we treat these as indicating what adults do? Certainly children are still developing, but there is also no reason to imagine that they will do an “about face” in relying on practices as they approach adulthood. Stivers, T., and Sidnell, J. 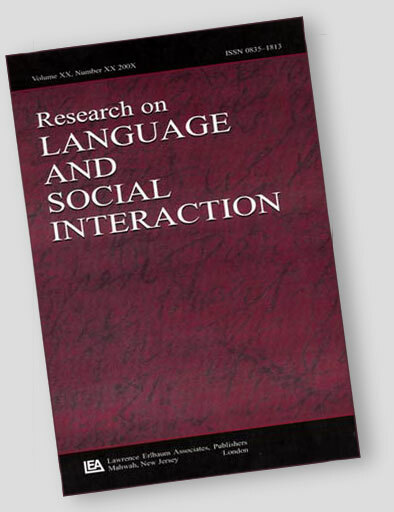 (2016) “Proposals for Activity Collaboration.” Research on Language and Social Interaction 49(2), 148-166.